The University of Groningen was delighted to welcome Eurocall in the second oldest university of the Netherlands. In 2014 the university celebrated its 400th anniversary, using the motto “For Infinity – 4∞” to underline its ambitions to work for and on the future of education, research and society in the Netherlands and beyond. The theme of Eurocall 2014 was “CALL Design: Principles and Practice”, which attracted many practitioners, researchers and students from CALL and related disciplines. We were able to broaden and deepen our understanding of using technology in language learning and teaching. 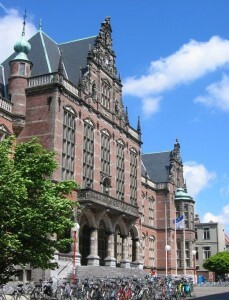 The venue for the conference was the Academiegebouw, the main university hall, hub of student activity, situated right in the city centre.